Melt the butter in a large glass bowl. Add the vanilla, the milk and then the eggs, whisking it together. Add the dry ingredients and whisk thoroughly to ensure it is all combined.The batter should be very liquid. Heat a medium sized non-stick skillet over medium heat. Melt a bit of butter in the pan and then pour a scant 1/4 cup of the batter into the pan. (Side note: I did not need to melt any additional butter while making the rest of the crepes) Tilt the pan around to cover the bottom with the batter. Let it cook for a minute or so and then flip to the other side. Let it cook another minute or so and then place it on a plate. 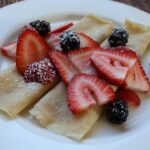 If you are making crepes for the family, they will keep well, stacked with a sheet of waxed paper in between each crepe, while you are making the rest of the batch. Serve folded in half or loosely rolled on a plate. Topped with fresh blackberries, strawberries and a sprinkling of powdered sugar, these are an excellent breakfast treat.